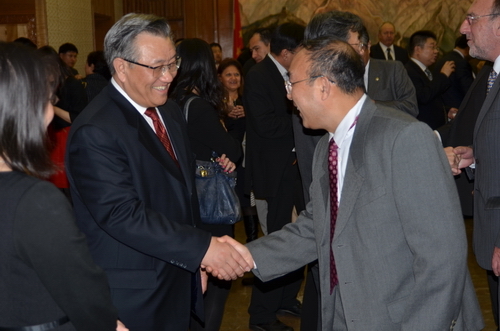 In the evening of November 22, Mr. Li Shenglin, Chinese Minister of Transport, and Mr. Qin Gang, Charge D'affaires of the Chinese Embassy, hosted a reception in honour of the delegates to the 27th General Assembly of the International Maritime Organization (IMO). The reception was attended by about 280 guests, including Mr. Efthimios E. Mitropoulos, the current IMO Secretary General, Mr. Koji Sekimizu, the newly elected IMO Secretary General, Mr. Esteban Pacha-Vicente, Director-General of the International Mobile Satellite Organization (IMSO), Mr. José Maura, Director of the International Oil Pollution Compensation Funds (IOPC FUNDS), the heads of the delegations to the General Assembly from 66 countries, permanent representatives at IMO, diplomats in the UK, heads of the international shipping industry bodies and representatives from the Chinese funded transport institutions in the UK. 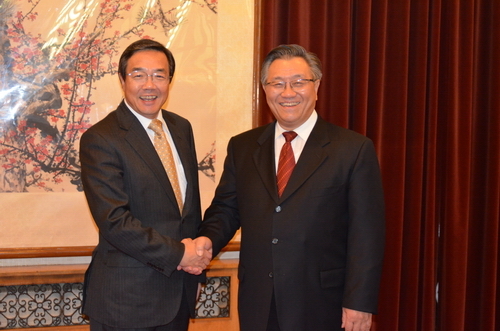 The reception was presided over by Mr. Li Guangling, Counsellor of the Maritime Section. The hosts and guests conducted extensive exchanges of views on strengthening international maritime cooperation, the current hot topics in maritime development and the major themes of the General Assembly. The biennial IMO General Assembly is the supreme authority of the organization. This session is held in London on November 21 to 30. Its agenda mainly covers the election of a new Council, the approval of the appointment of the next Secretary-General, the consideration and adoption of the 2012-2013 budget and work plan, the consideration of the reports from the special committees and diplomatic conferences held since last session, the voluntary audit mechanism for member states, the combat against piracy and armed robbery against ships, etc.. The General Assembly will also adopt a number of resolutions on the relevant matters. IMO was founded in 1959 as the United Nations’ specialized agency for maritime safety, security and the prevention of marine pollution. It is based in London. The organization currently has 170 members and three associate members. Its technical standards have been widely accepted by the international shipping community. China resumed its membership in the organization in 1973 and was elected as Category B council member in 1975 at the 9th General Assembly of the organization and has been re-elected ever since. The country was elected as Category A council member in 1989 at the 16th General Assembly and has since successfully been re-elected for 11 sessions. At this session, a new Council will be elected on November 25. Currently, there are 10 countries competing for 10 Category A council members, 10 countries for 10 Category B members and 26 countries for 20 Category C members.